The season is winding down, there’s a nip in the air each morning, and, yes, that means school is back. While some students are inevitably finding the transition tough, others are embracing the season, gearing up for another exciting semester away at post-secondary school. In the spirit of making it home to see mom and dad for Thanksgiving – and the odd weekend away with friends – we’re profiling some of our favourite new and used back-to-school cars for 2018 and beyond, all available at Eagle Ridge GM. 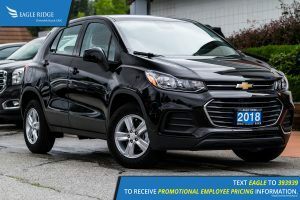 An honest-to-goodness urban legend with all the compact style, performance, and utility you’d expect from a much larger vehicle, the compact 2018 Chevrolet Trax comes to the table ready for the school year showcasing standard iPhone integration and a 4G LTE WiFi hot spot, as well as a stellar fuel efficiency rating of 7.1L/100 km from its 1.4L turbocharged Ecotec engine. With an athletic stance and bold style, the Trax is the perfect vehicle for parking and traversing city streets, and feels just as at home in the countryside thanks to its AWD system. The Trax features 8 innovative seating configurations, making room for object up to 8 feet long – giving you enough room for any activity or weekend trip you can imagine… or for taking home that pile of laundry you’re neglecting. Being a student and owning a car often can mean a tight budget. Any efficiency you can afford yourself during a time of constrained finances is a big bonus when it comes to purchasing a back-to-school vehicle – and saving at the pump is key. 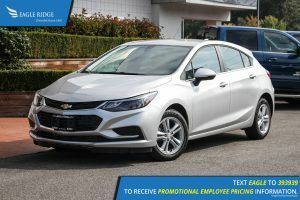 The 2018 Chevrolet Cruze LT hatchback is the ideal car for those who like to stay thrifty at the pump, while keeping cubic feet and storage at a maximum – all while not breaking the bank. The 2018 Cruze hatchback features an impressively fuel efficient 1.4L 4 cylinder engine coupled to a smooth 6-speed automatic transmission. That powertrain is also responsible for a killer fuel efficiency rating of a minuscule 5.8L/100 km – all while offering 153 fun-packed horsepower and standard turbo-charger. Hey, it’s not always about walking out of the dealership with a brand new car – we know that. For students and their families, brand new isn’t always the best choice – or a choice at all. Shopping for a used vehicle is a smart way to help minimize monthly payments and alleviate extra financial stress on top of student loans and other schooling costs. Eagle Ridge GM maintains a fantastic selection of quality used vehicles, perfect for the discerning student with their eye on the prize of road-going freedom. 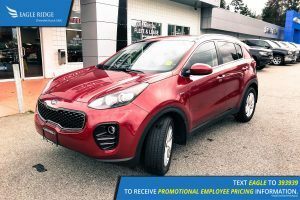 Take for example, the used 2017 KIA Sportage LX. Featuring all-wheel-drive, modern and innovative styling, and a long list of tech and safety features, the Sportage is a fine vehicle worthy of all your driving, exploring, and back-to-school needs. Featuring a 2.4L four-cylinder naturally-aspirated engine, heated seats, rear view camera, and a noteworthy fuel efficiency rating of 10.5L/100 km combined highway and city – the Sportage is an iconic compact SUV with the style and utility you’ll need to maintain that ideal school/life balance while not breaking the bank – thanks to a price tag of a mere $21k. If you live far away from home, and are like the legions of youth British Columbians who enjoy an active lifestyle, the perfect back to school car is sometimes more important that the extra rent for a fancy rental home. Vehicles enable students to maintain an appropriate school/life balance that’s as much about enjoying your time off, as is it good grades. Come and speak with us today about your back-to-school vehicle needs. Your perfect vehicle is here waiting.